This is the way to us! 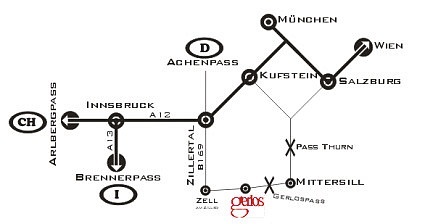 Arrival from 4:00 p.m. and departure until 10:00 a.m.
From Munich arriving at the A 12 direction Kufstein to the exit Zillertal (Attention: toll road sticker charge) - straight on at B 169 until Zell am Ziller - there you turn left dirction Gerlos - our house is situated at the beginning of the village (district Ried) on the left side. Taxi Kammerlander is your shuttle and bring you to your holiday destination! We have got 4 apartments available in our guest house. Bookable from 2 up to 4 persons (on request you can also book 5-6 persons).